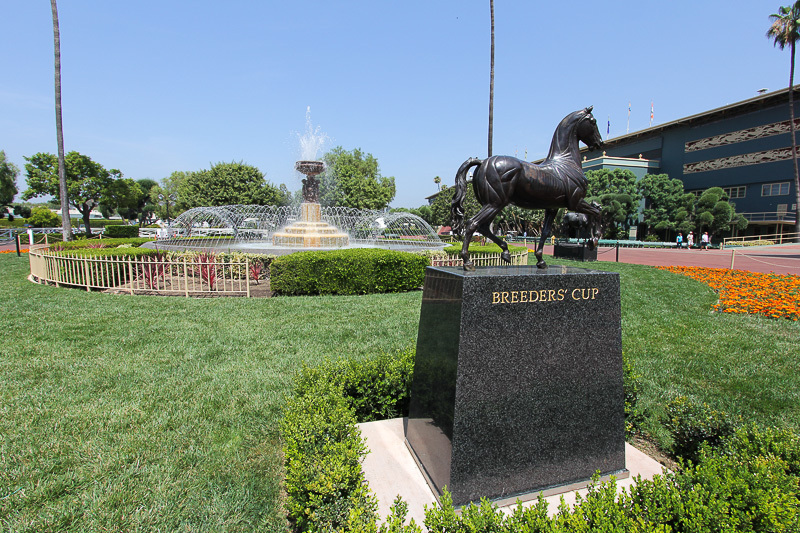 June 8, 2014 - Today we were back at Santa Anita Park in Arcadia, CA to take in the Seabiscuit Tour. 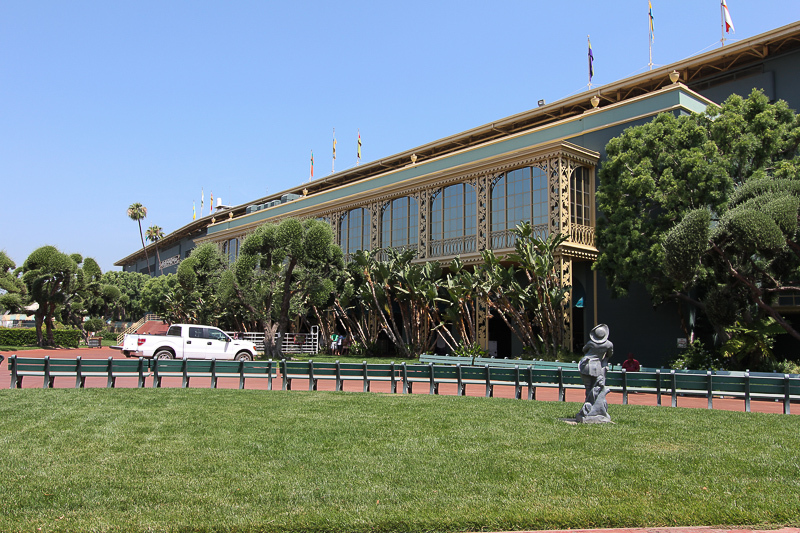 The park occupies about 320 acres and was the first race track in California when it opened in 1934. 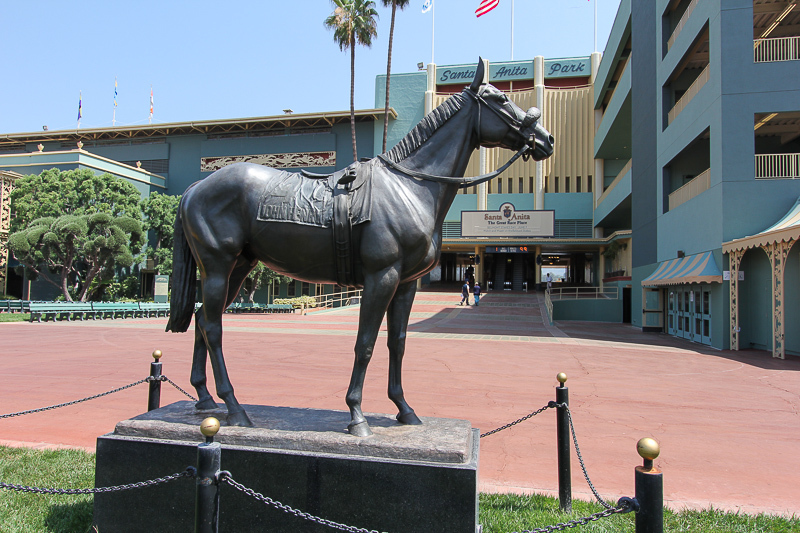 With its backdrop of the San Gabriel Mountains, it is considered one of the world's most beautiful race tracks and its Art Deco style hasn't changed since it was first built. 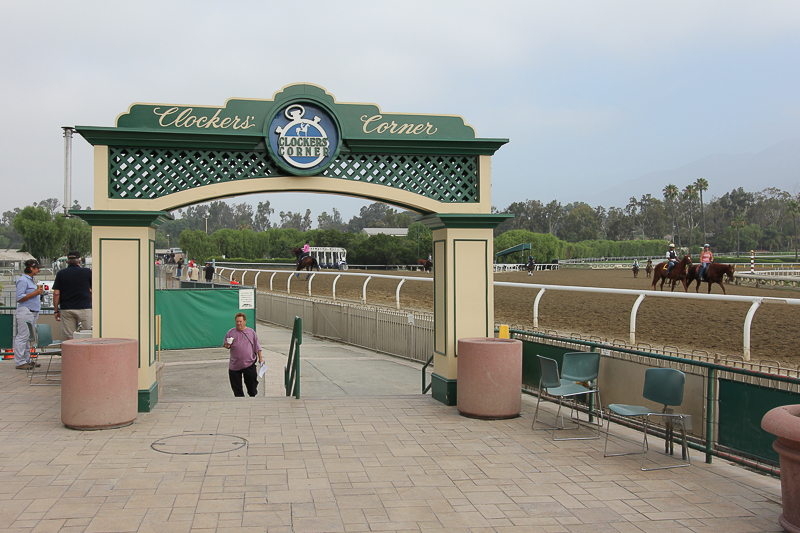 Our tour began at Clockers' Corner, where a breakfast buffet is served and you can watch the morning workouts. 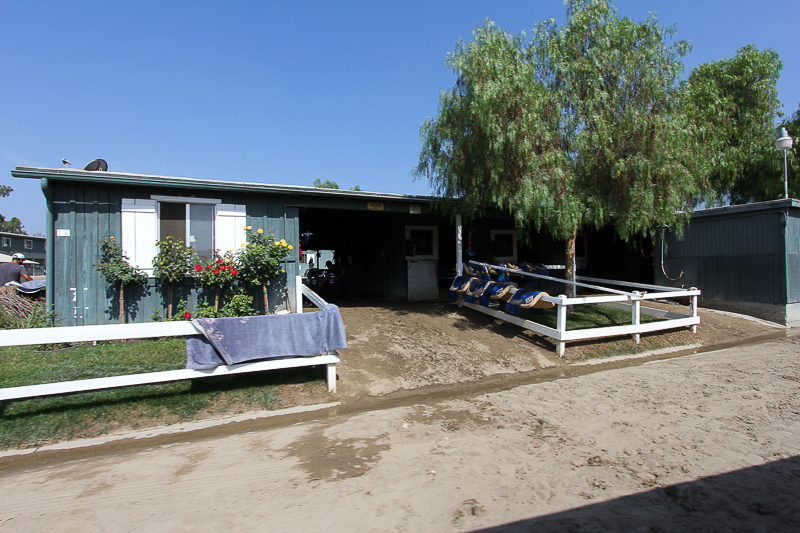 This is the barn where Seabiscuit had his stall, which was larger than the average horse stall. 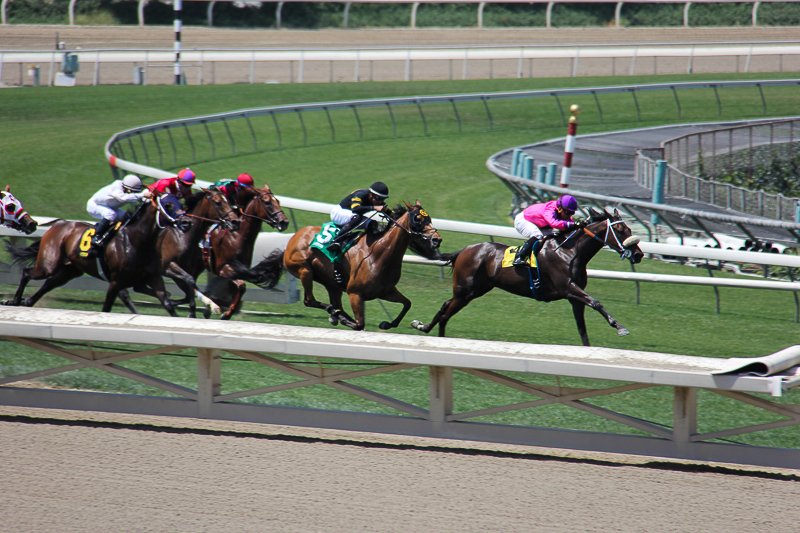 Most thoroughbred horses have goats to keep them company in their stalls. 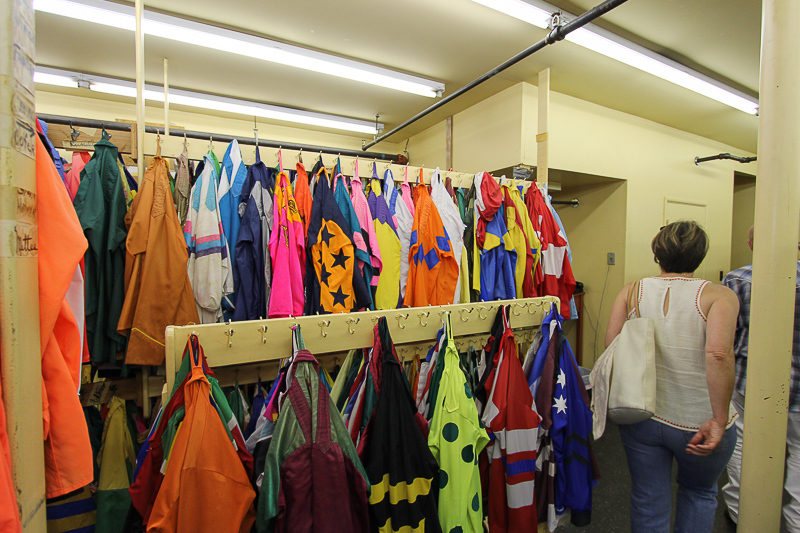 Seabiscuit need a larger stall because his companions included a monkey named JoJo, a dog named Pocatell and a fellow horse named Pumpkin. Seabiscuit hated goats and violently abused them. These "hot walkers" are some of the 600 employees who live here. In total, the park has about 4,000 employees. 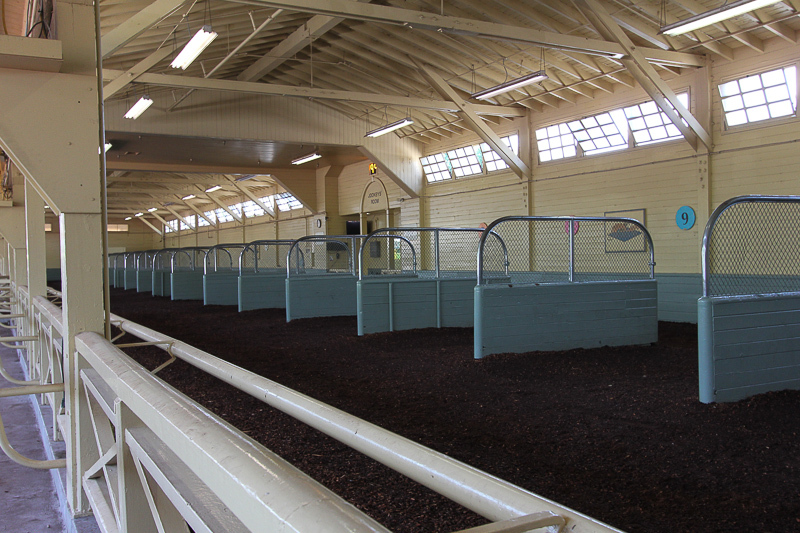 This is the interior of the receiving barn for all horses coming into Santa Anita. Documents are produced and horse identifiers check the numbers tattooed under the horses' lip to ascertain the true identity of the horse. 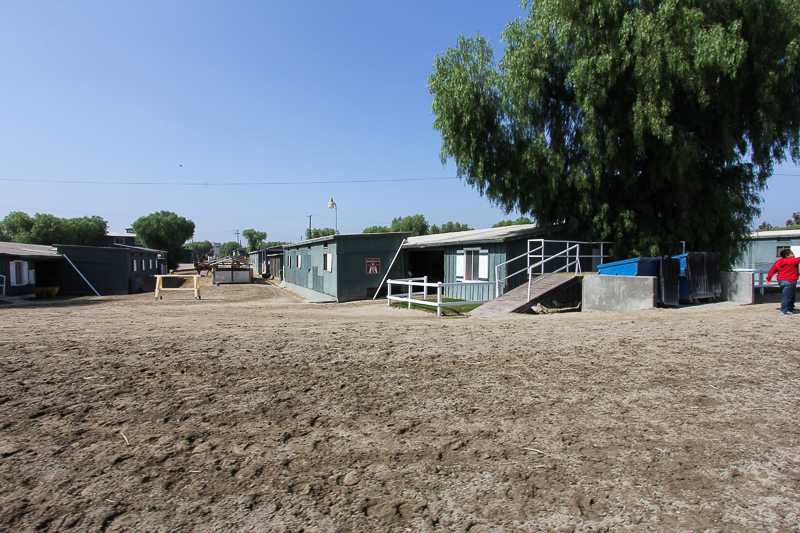 From 1942 to 1944 the park was converted and used as an internment camp for Japanese Americans. 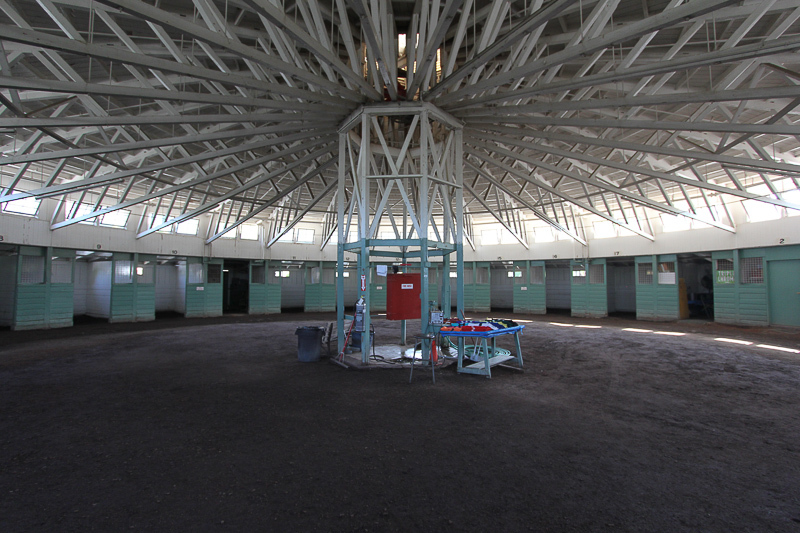 The receiving barn was converted and used as shower facilities for the Japanese. 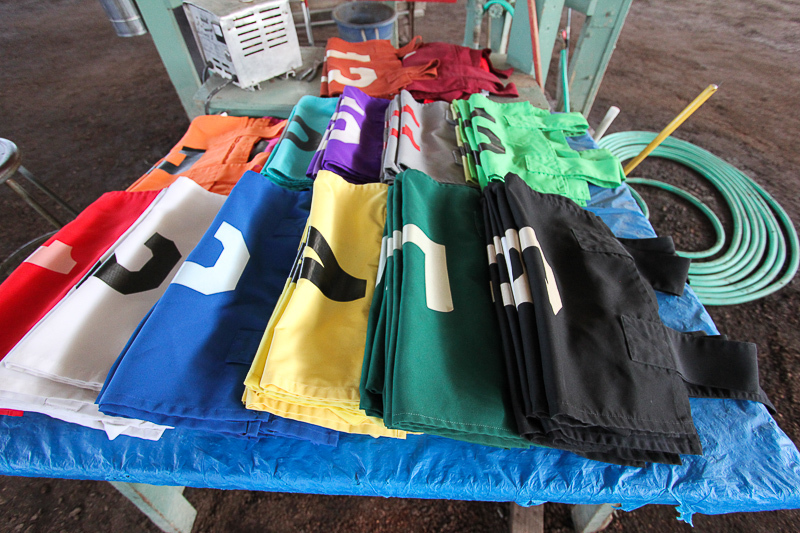 These canvas numbers are placed on each of the horses entering the barn for identification. 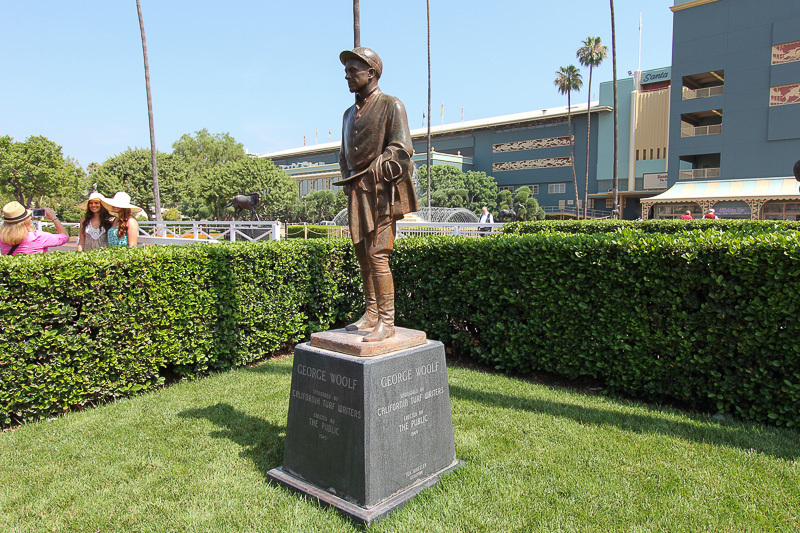 This is a statue of George "The Iceman" Woolf, a Canadian jockey played by the real life jockey, Gary Stevens, in the 2003 feature film Seabiscuit. 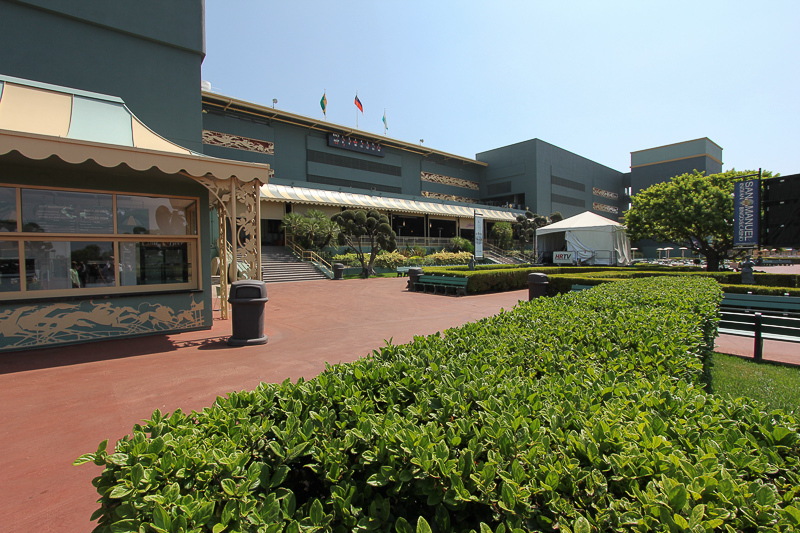 This is the paddock, where the horses are assembled and saddled before each race. 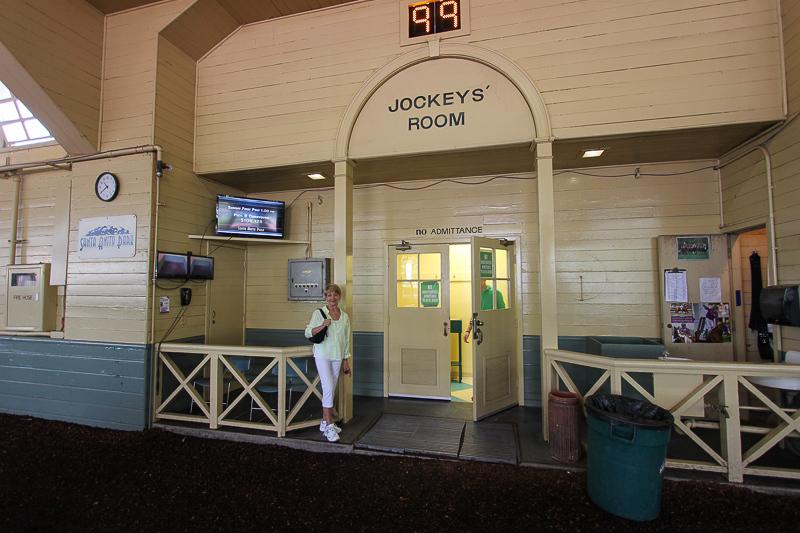 The jockeys' room leads right into the paddock. 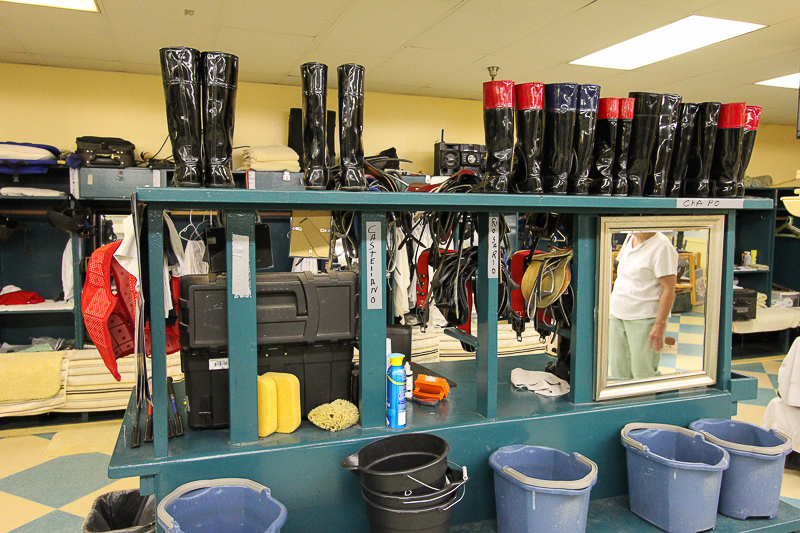 Each of the jockeys is assigned a space for them to stow all of their gear. 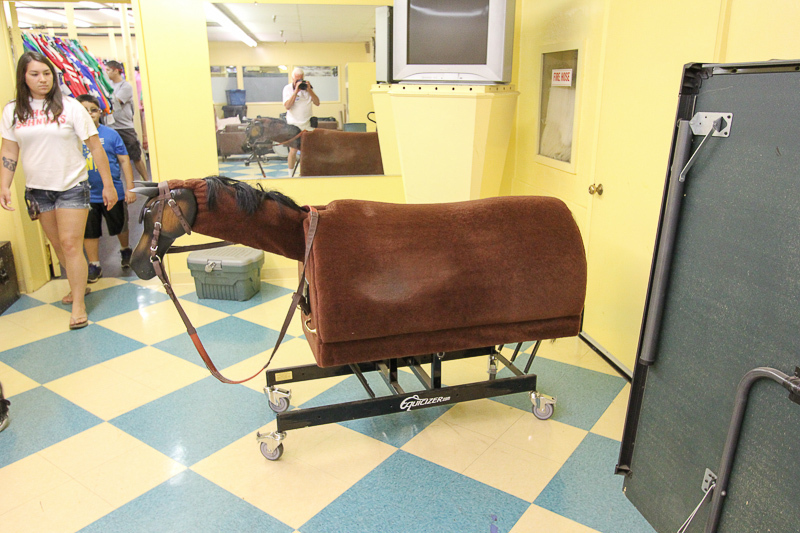 This mechanical horse is used by the jockeys for exercise. Tobey Maguire, who portrayed Red Pollard in the Seabiscuit movie, didn't know how to ride a thoroughbred, so he rode this "horse" as it was pulled around the course on a flat bed truck. 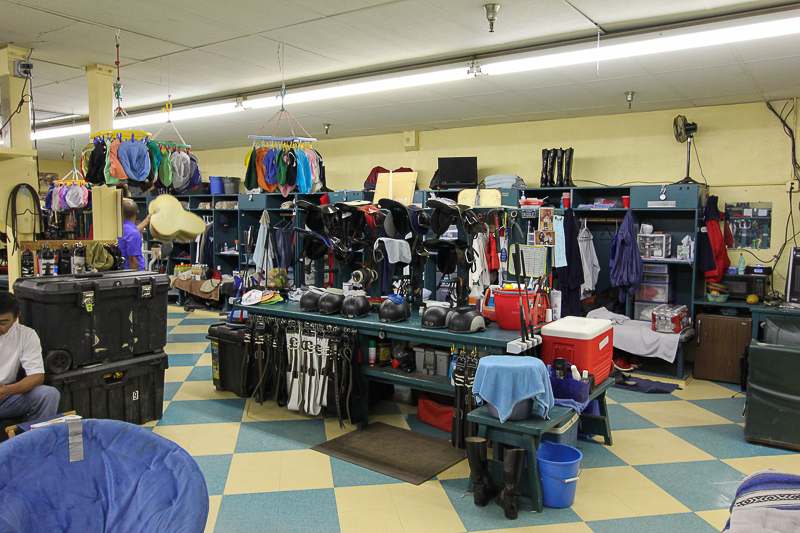 Our tour guide tells us that if you look real close at these scenes in the movie, you can see the fabric on the horse. 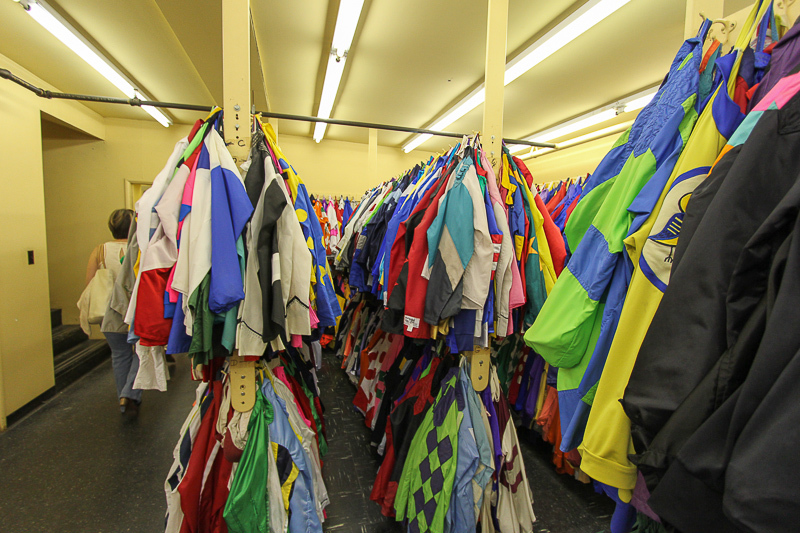 Just off the jockeys' room, the owners' silks are stored. It's very colorful! 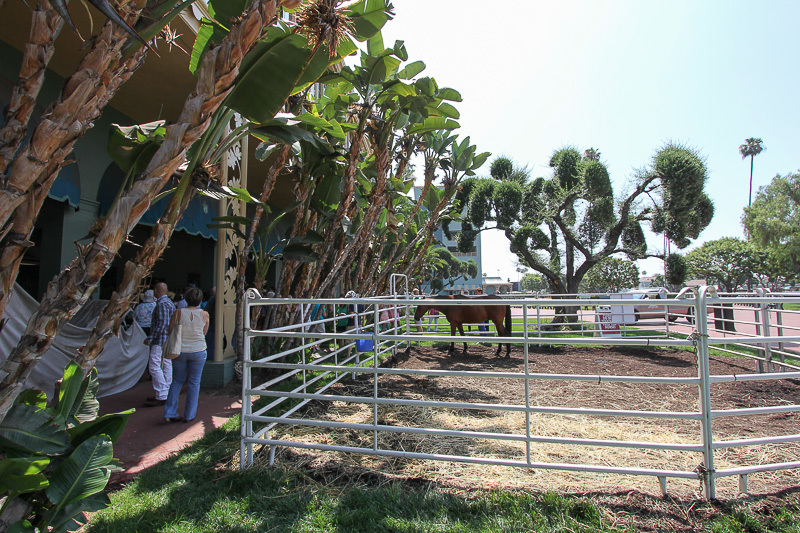 Just outside the paddock is the walking ring where the horses are paraded before each race. 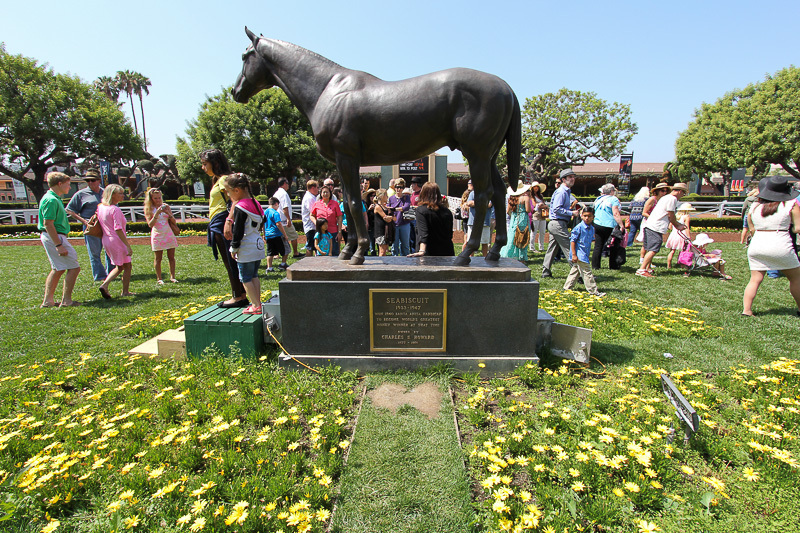 In the center of the ring is the statue of Seabiscuit, Santa Anita's most well known thoroughbred. 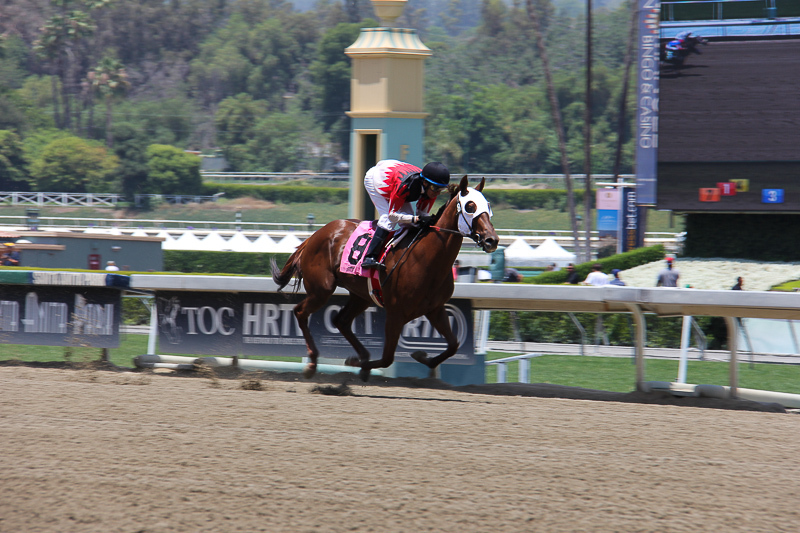 This is Fighting Furrari, who was the primary horse portraying Seabiscuit in the movie. Notice the topiary in the center and the absolutely huge birds of paradise on the left. 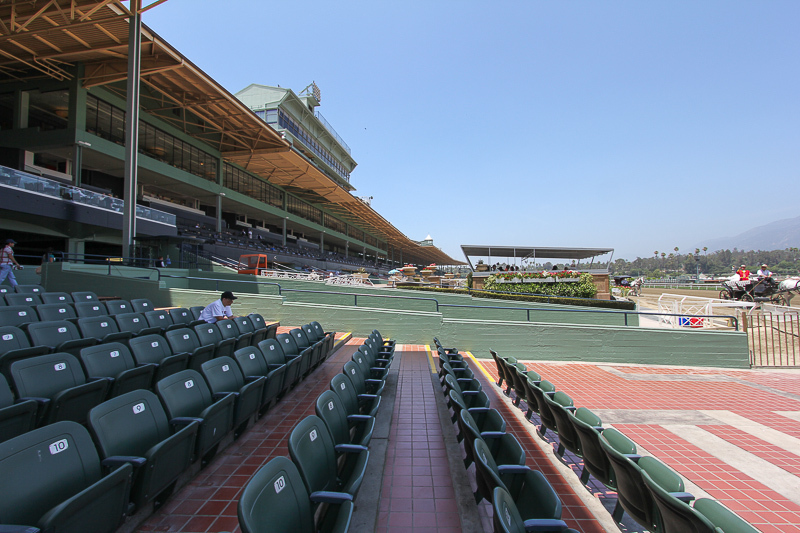 The Santa Anita grandstand is 1,100 feet long and holds 26,000. The infield area can accommodate another 50,000. 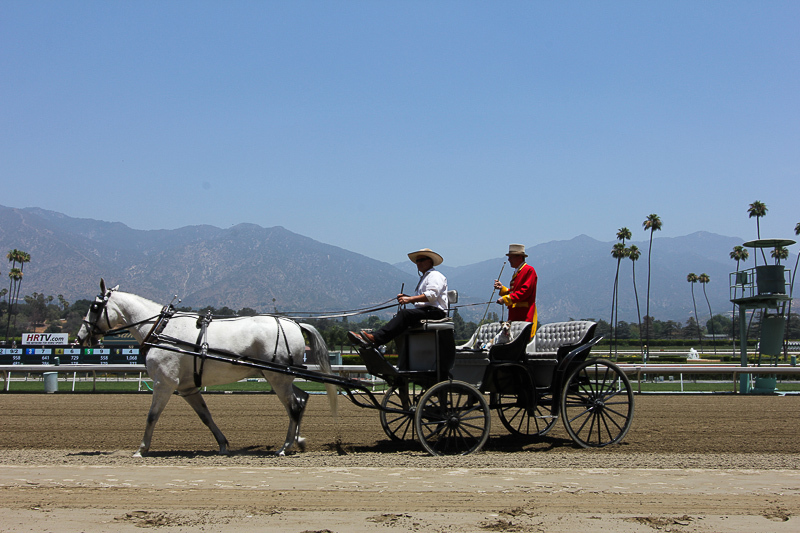 The bugler, who announces the post parade for each race, arrives in style at Santa Anita. 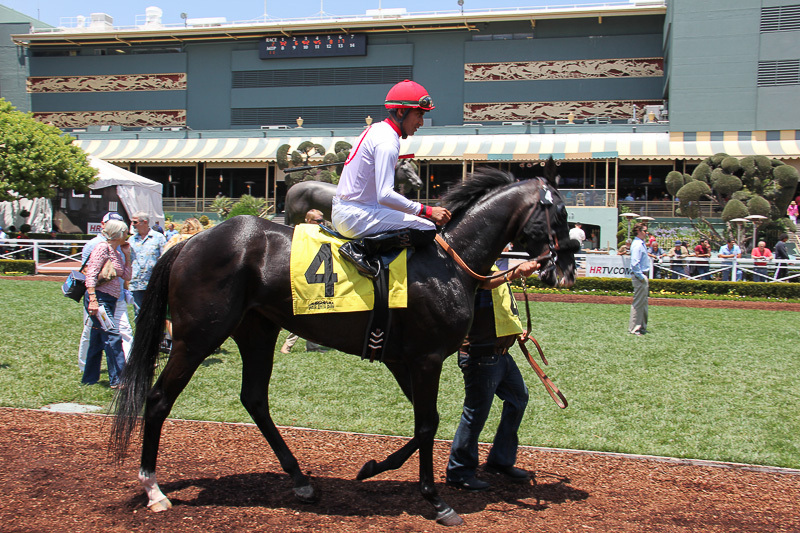 In the second race today, the number four horse was Tribal Chatter. 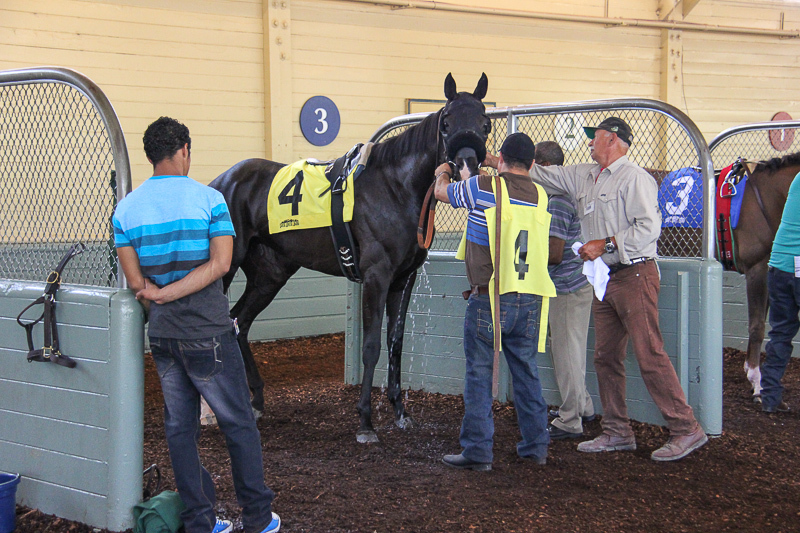 Here he is getting saddled up in the paddock. Here he is again in the walking ring. 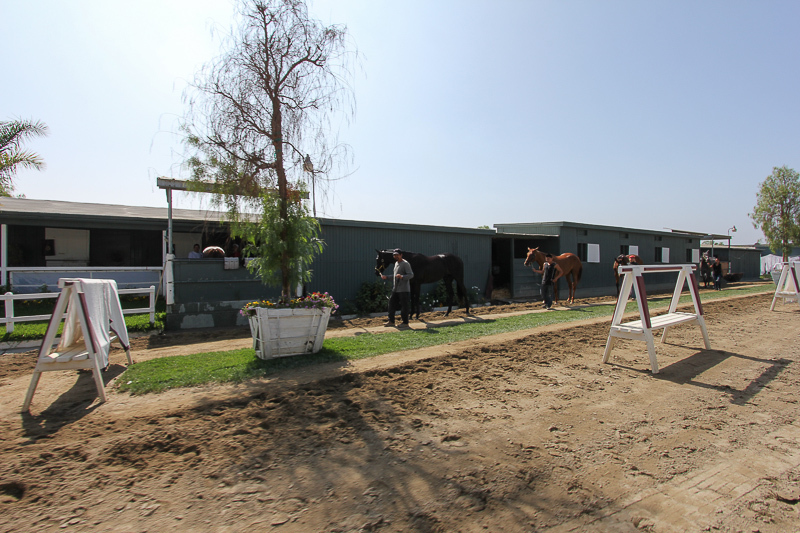 Interestingly, the horses and their jockeys meet each other for the first time here in the walking ring. 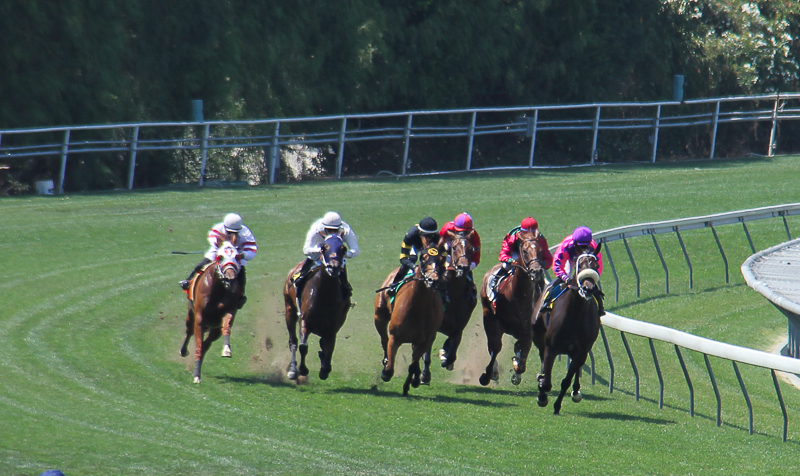 Win or lose, you can't beat the excitement of thoroughbred racing. This is great tour that lasts about one hour (15 minutes in the tram and 45 minutes walking). The price is great (it's free) and it's very informative. Giddy up!